Some functions behave in an interesting manner near particular values of x or y, or at their extremities (as x→∞ and/or as y→∞). They may converge on a particular value, or on some function. In either case, the line or function towards which the original function converges is called an asymptote. You will start your journey with much simpler examples than this one, but if you examine the graph illustrated at left I can explain the principles for you. You will notice that there is a vertical (dashed) line at x = -1. You can see that, as the graph (blue line) approaches x = -1 from the left, it bends upwards and ‘sky rockets to infinity’ without ever quite touching the line x = -1. Similarly, as the graph approaches x = -1 from the right, it bends downwards and ‘dives to infinity’ without ever quite touching the line x = -1. 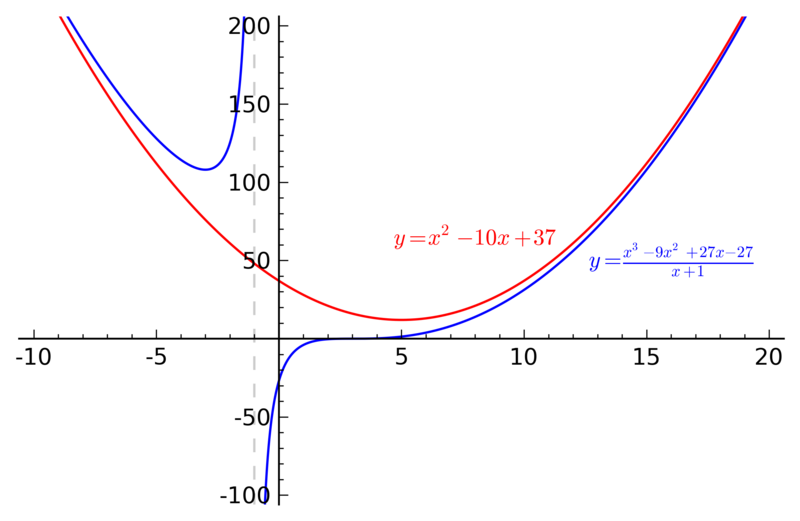 This means that there is no value for the function at x = -1, even though the graph is defined and has finite values for any value of x near x = -1. We call x = -1 an asymptote of the function. In a similar way, you will observe that, as x→∞ and x→-∞ (i.e. as we move to the extreme left and right of the graph), the function (in blue) very closely matches the parabola y = x² – 10x + 37 without ever quite touching that parabola. We therefore say that y = x² – 10x + 37 is a curvilinear asymptote of the function y= (x³ – 9x² + 27x – 27)/(x – 1). In high school, you are very unlikely to encounter curvilinear asymptotes. In fact, it is highly unlikely that you will even have to deal with what we call oblique (slanted) asymptotes. All your asymptotes will be vertical or horizontal, and that makes your job of learning about them very much easier! This is a first step towards understanding hyperbolae and other rational functions. Whenever a function of x appears as a denominator, our understanding of the overall function is going to be dominated by fractions. In this video we explore what happens to fractions with extremely large and extremely small denominators. In this way, we learn that asymptotes are lines that a particular function will approach, but never intersect with, as it tends towards a particular value or towards infinity. Hyperbolae are predictable functions. There are certain key elements to look for that will assist you in graphing them quickly. how to locate the points of closest approach to the origin. With practice, once you have drawn and labelled the axes, you should be able to use these keys to draw an accurate sketch of your hyperbola within, say, 20 seconds. What happens when an hyperbola has a negative numerator? What difference does it make to the graph? In other words, if you need to graph y = -3/x or some similar hyperbola, how do you interpret the -3 and how does understanding the nature of this constant help you graph the function quickly? I provide a very simple answer to these questions and show that the change is dramatic, but quite elementary. This time we begin to alter (tamper with) the x and y values in the equation for an hyperbola. In other words, how would we graph the equation (y - 4) = -3/(x + 3)? You may recognise this as a way of changing the location of the graph. Another way of understanding this form is to view the zeros in the expression (y - 4)(x + 3) as providing the equations of the asymptotes. This insight is important because our original equation, (y - 4) = -3/(x + 3), could be rearranged to read (y - 4)(x + 3) = -3. Now, if (y - 4)(x + 3) = 0, then y = 4 and x = -3 would be considered as zeros of the equation. However, in the equation (y - 4)(x + 3) = -3, it is impossible for y to have the value 4 or x to have the value -3. The tables have been turned! We can choose a y value as close to 4 as we wish, or an x value as close to -3 as we wish, and find a corresponding value for x or y. It is just that we cannot have those exact values. This is a clever way of identifying asymptotes of functions. In this case we would identify y = 4 and x = -3 as asymptotes of (y - 4)(x + 3) = -3 and, therefore, (y - 4) = -3/(x + 3). You will also learn in this video that, if (y - 4)(x + 3) = -3, then we are really looking for two numbers that multiply to give -3. This will help us locate points of interest near the intersection of the asymptotes. I assure you that you will understand the video more easily that the above text! Now that you know how asymptotes appear in equations, you can deduce how to create (or recognise) multiple asymptotes. In this video we will discover how to analyse a basic rational function for its horizontal and multiple vertical asymptotes. We also analyse equations that produce multiple horizontal asymptotes as well! We will then sketch quite attractive, but complicated-looking, graphs very rapidly using the skills we have already learned. In the next video we learn that we can have oblique asymptotes (and even curvilinear asymptotes)! QUALIFIER/DISCLAIMER: In this series of videos the curve may not exist in all the locations that I describe. If the numerator is sufficiently small, it will ... but, if you think of these graphs as contours of a three dimensional surface, you will see that sometimes the hill-hummock-mountain does not have sufficient altitude to meet the contour line. For example, when graphing (y - 4)(x + 3) = -3, we could consider graphing z = (y - 4)(x + 3) to obtain a surface in three dimensions where there is a valid z-value for every x and y value. If you then imagine a plane at z = -3 cutting this surface, the curved line of intersection is the graph that we want. In this case, the plane z = -3 will cut the surface where we specified in the previous video. With more complicated equations, this may not be the case. If this three-dimensional explanation does not make sense to you (yet), please just accept the fact that I have not checked the finer details of these graphs, because that is a tedious task and would have made the videos very much longer (and detracted from what I was trying to achieve). If you are checking the graphs at www.wolframalpha.com and do not see the same result as mine, try multiplying the numerator by a small coefficient like 0.05 and see if that makes a difference! As always, I encourage you to experiment. Now we start to have some creative fun ... as we discover that asymptotes do not have to be vertical or horizontal! In fact, asymptotes can be oblique lines and even curves. Using a number of examples I explain how to construct equations with chosen asymptotes and then draw their graphs. Interestingly, I ad-lib these videos and make up the equations as I go. Because of this, occasional 'errors' creep in that I am happy to leave in the video. In a couple of my examples, the central loops that I draw do not actually appear in the true graph because I chose a constant that was too large. When you have viewed the synthesis video that is coming you will see that the graphs of these relations are like contours on a 3-dimensional surface. The constant that I chose meant that I was choosing an altitude too high to intersect a small mound! In the video I mention a website that I recommend called Wolfram Alpha. Let me recommend that you visit and type in some of these equations to see the graphs produced. Also, if you replace the constant with a z and type something like z=(y-x)(y+x) you will see the 3-D surface that is being studied. In the next video we discover what happens when we have 'double' or 'triple' asymptotes! 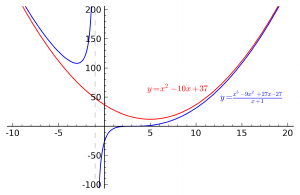 When sketching polynomial equations you may recall that, near a double root (from an even-powered factor), the curve will behave like a parabola near the x-axis. In a similar way, where the term producing an asymptote is raised to an even power, it results in a duplication (or 'mirroring') of the relation on either side of the asymptote. In the next video I will explain this in terms of analysing three-dimensional surfaces! In this video, however, I simply wish to share how to graph such relations using this 'mirroring' idea. Let me recommend that you visit Wolfram Alpha and type in some of these equations to see the graphs produced. Also, if you replace the constant with a z and type something like z=(y-x)(y+x) you will see the 3-D surface that is being studied. In the next video I try to explain how polynomials and their roots, and relations (and rational functions) and their asymptotes, are linked in a wonderful synthesis! When analysing polynomials we look for roots. When analysing hyperbolae (and their relatives) we look for asymptotes. One is located where zeros have to be, and the other is where zeros are impossible! We can see a connection between the two ideas when we think in terms of three-dimensional surfaces and select a z-value (third axis/dimension) that gives us contours. If you are able to imagine or picture the three dimensional surface, it will help you understand how to interpret what the asymptotes are telling you about the graph. In analysing Type 2 and Type 3 rational functions, one normally divides the numerator by the denominator in order to find the horizontal-oblique-curvilinear asymptote. The rational function that remains may (or may not) have a constant as numerator. In high school questions, it usually will. If it is not a constant, however, it will be a polynomial in x and will therefore vary in value as x varies. This means that the constant we expected to have keeps changing its size and may even have a value of zero or change from positive to negative! All this has implications for how we interpret a function/relation near those critical x-values. In this video, in order to demonstrate the effect clearly, I use just one example with multiple horizontal asymptotes. Of course, a rational function will only have one such asymptote and will be much more easy to graph. This principle has been described in previous videos in this series ... but I thought you might benefit from a summary video as well. What Happens if the Numerator Varies With y? Mathematicians love to ask, "What if?" In this case, I ask the question, "What if the numerator on the right is also a function of y?" In other words? What if the value of the numerator (and whether it is positive, zero, or negative) is also governed by the y value? What effect will that have on our graphs? First, we must appreciate that these would no longer be rational functions ... indeed, they will not be functions at all (simply relations)! I show how to interpret such numerators and show how our graphs are affected by them. My son isn’t rapt about attending tutoring but Graeme has taken the time find out the things my son is interested in and relate the maths topics to them. I can’t speak highly enough of his patient, calming manner. The maths resources provided have been helpful (and sometimes fun!) in my son’s learning and I have noticed a great improvement in his confidence and ability since starting tutoring.